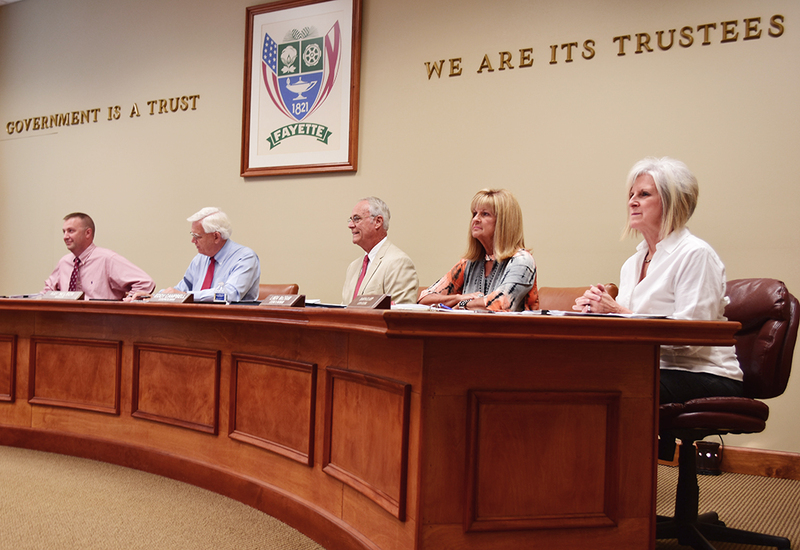 Shown at the Fayette City Council’s Aug. 28 meeting are from left: Councilman Jason Cowart, Mayor Ray Nelson, Councilman Eddy Campbell, Councilwoman Linda McCraw and City Clerk Dawn Clapp. Not present at the meeting were councilmen Jerry Nichols and Cedric Wilson. Jeff Huff, of the Fayette Medical Center (FMC), gave the hospital’s annual report to the Fayette City Council at its Aug. 28 meeting. Councilmen Jerry Nichols and Cedric Wilson were absent from the meeting. Huff introduced several members of the FMC staff in attendance, then told the council that the one-half cent sales tax passed by the council three years ago to help the hospital has made a tremendous difference in the way the facility is able to do business. He said that without the tax revenue and the generosity of the community, the hospital’s cash position would have been in the red for the past three years.